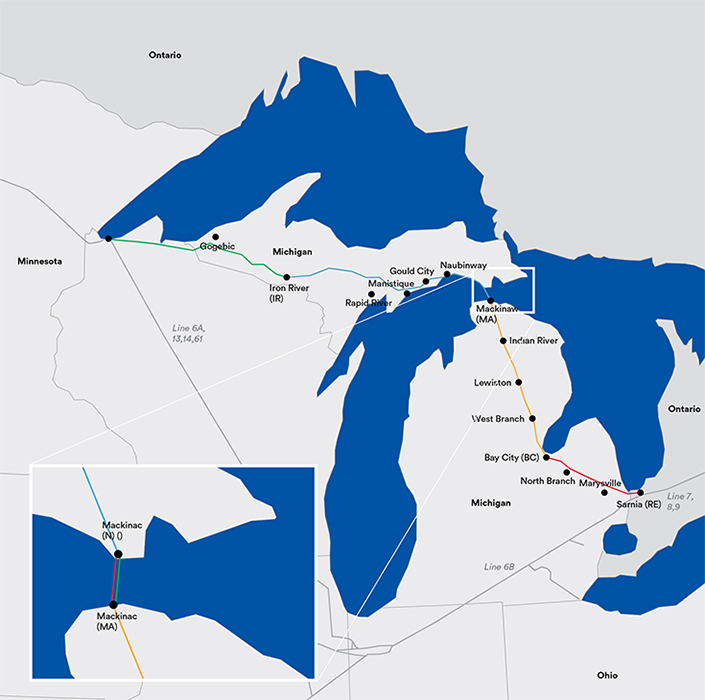 A map of Enbridge's Energy's Line 5. Enbridge Energy has agreed to pay the federal government $1.9 million to settle claims it didn't properly inspect some of its pipelines, including Line 5. The fine stemmed from a consent decree following an Enbridge pipeline oil spill in the Kalamazoo River nearly eight years ago. The federal government alleged the mammoth Canadian company violated parts of that deal, according to a Wednesday filing in federal court . The U.S. Environmental Protection Agency and Department of Justice alleged six violations of requirements that Enbridge perform timely inspections of its pipelines. Two concerned the 645-mile Line 5 — a section from Bay City and Sarnia, Ontario, and another between Iron River and Superior, Wisconsin. “All of the inspections pertaining to the settlement have been completed, and no safety concerns were at issue,” Matt Barnes, an Enbridge spokesman, said in a statement. Barnes said the company’s inspections still complied with federal regulations. James Clift, policy director at the Michigan Environmental Council, said he’s troubled by the revelations. That 65-year-old Line 5 has become a hot-button political issue amid fears that a rupture would threaten the Great Lakes and allegations that Enbridge has not been transparent about the pipeline’s condition. The filling came in a case related to a different Enbridge pipeline: Line 6B, which ruptured in 2010, triggering one of the worst inland oil spills in U.S. history. More than 1.2 million gallons of crude oil was spilled, requiring a four-year river cleanup. Enbridge has paid nearly $1.3 billion for cleanup and restoration. In 2017, a judge approved an agreement in which Enbridge agreed to pay $177 million in civil penalties to settle claims related to that spill and one in Illinois. That agreement included various provisions aimed at boosting safety, including the inspection requirements at issue. I'm shocked I tell, shocked that Enbridge would ever skirt rules and inspections. Enbridge has always been a company that valued safety and the following of environmental rules to the letter. Corporations exist solely for the benefit of society in general, with no thought to the pursuit of profit over public safety or the environment. Their investors begin every day by asking themselves, "How can I use my wealth to make the world a better place?" And that is different from human nature in general? I’m discouraged that our state officials are not serious about protecting the Great Lakes. Lee Chatfield, who represents counties that are on the Great Lakes, in the 107th House District, has a horrible record on protecting the environment and has consistently refused to hold Enbridge accountable. He was also the Michigan legislator who received the highest dollar value of free food and drink, in 2017, from lobbyists. It’s no secret who Lee Chatfield represents and, spoiler alert, it’s not his constituents . 1.9 million-pocket changes to those punks.